We are moving right along through this multi-post series and now we’re starting to get to a very important topic, Backup. At home I have both windows and mac computers, public cloud storage, and virtual machines that need to be backed up. In the next couple of posts we’ll be going over how to processes to back them all up to a NAS. Today I’m starting off with Time Machine Backups. 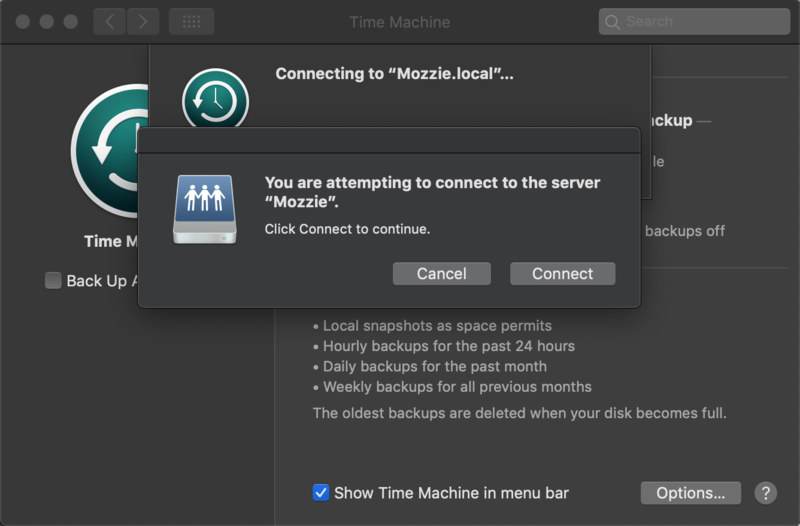 As many of you know Time Machine is the built in software on MacOS to back up the computer. 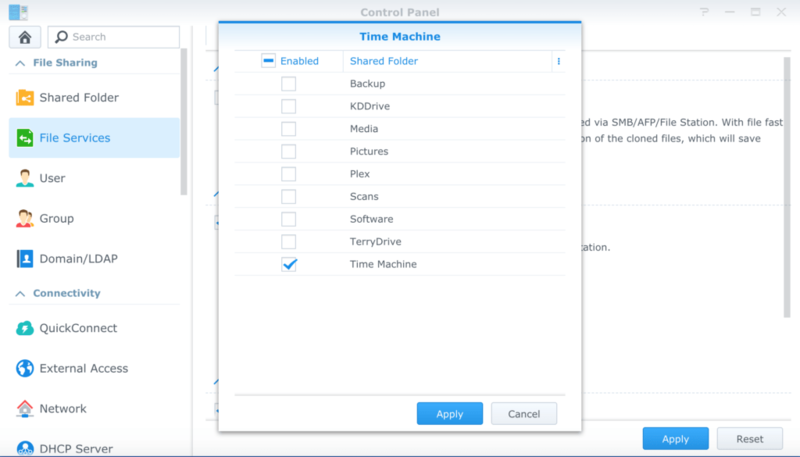 Time Machine can be used with an external hard drive or a network location. I prefer network location because the process is more automated. If you use a USB hard drive then that requires you to manually connect the drive for it to work. This isn’t a big deal if it’s a iMac, Mac Mini, or Mac Pro. But My wife and I both have Macbook Pros and we’re more mobile. So carrying around an extra drive will make the process more cumbersome. 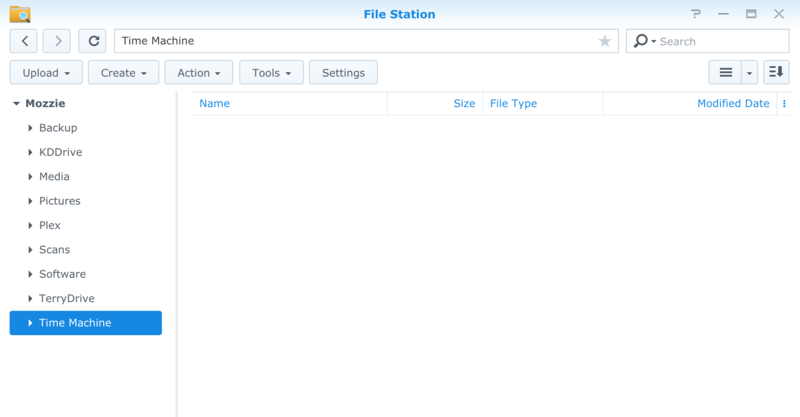 First you need to have a shared folder available to used for Time Machine. 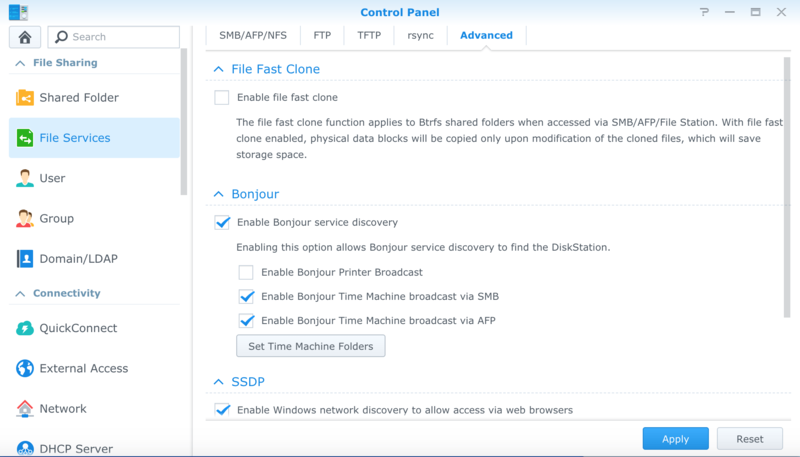 By default on Synology, when you create a share, the NAS will enable both SMB and AFP. Apple can communicate with either protocol but, if you want spotlight search to work you’ll need to use AFP. I prefer to create a dedicated share for backups instead of dumping backups in with the rest of the shared folders. It makes more sense in a logical file management sense but in the end, either way will work. 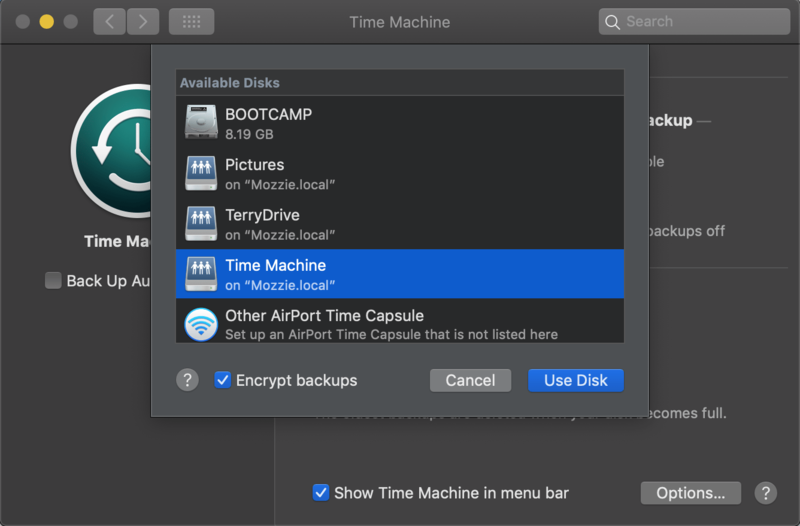 Because Time Machine is less flexible then other Backup products I created a dedicated share for it name Time Machine. One limitation of Time Machine is that you can only specify the top level share for Time Machine backups. So I can’t create subfolders in the backup folder for Time Machine to keep things organized. Next lets double check permissions. As you can see just my user account and my wife have access to the share. When we get to the Veeam post I’ll be adding a user account for that as well. Now we have to enable the time machine services on the folder. In Control Panel go to File Services > Advanced. Check the box for the following settings. Then Click on Set Time Machine Folders to select the folders you want macs to be able to back up to. 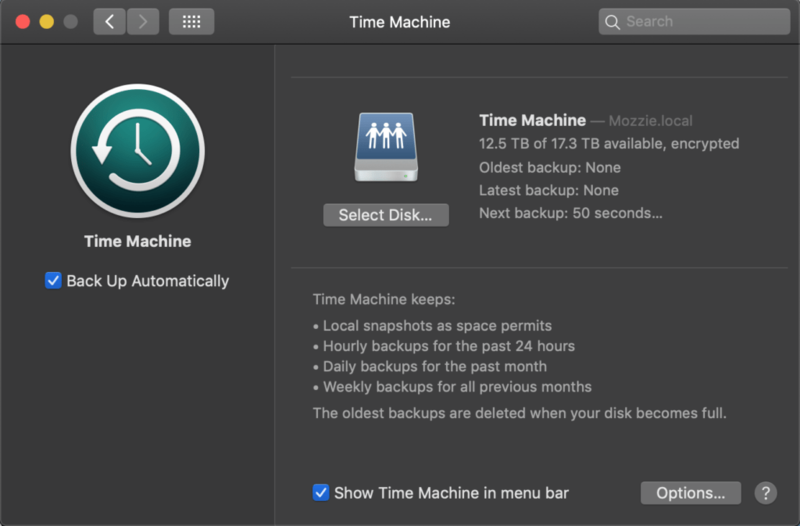 Check the Folders that will be used for Time Machine Backups then Click Apply and Apply again on the File Services page. Next lets connect a mac to the share. Because I have the AFP protocol enable the Synology is automatically found on my Mac in Finder. 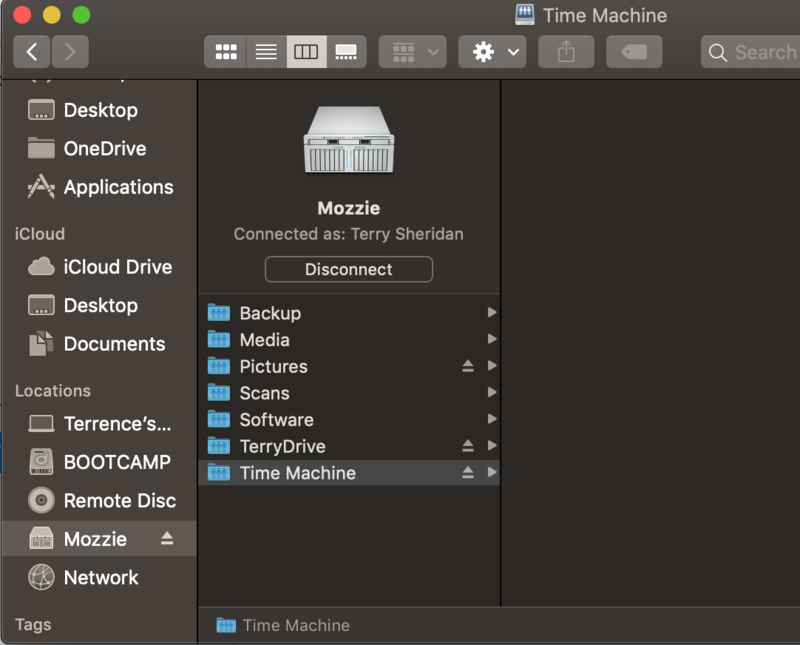 I’ve mounted the Time Machine folder to the mac so it’s automatically reconnected with I log on to my Mac. Next lets open Time Machine. 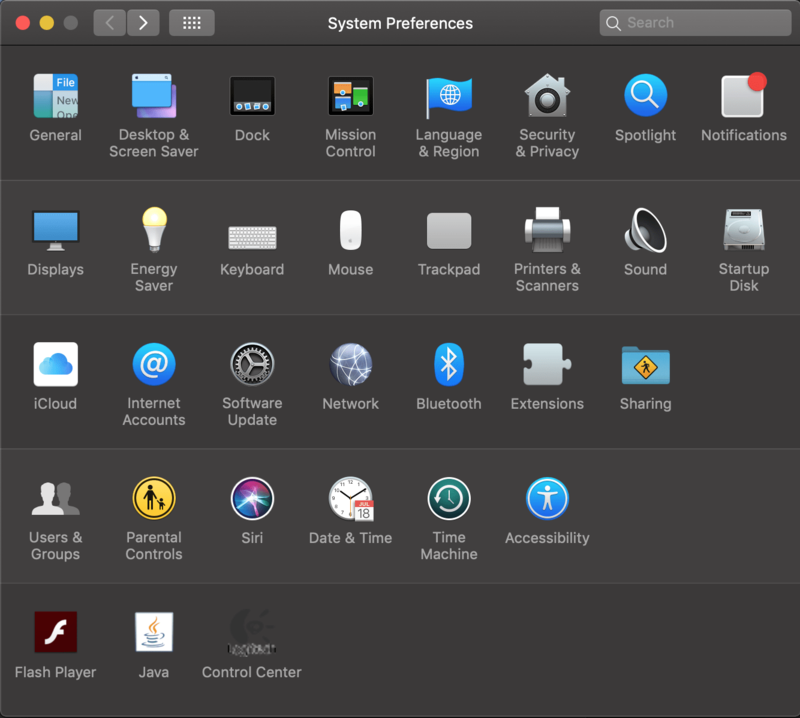 To configure Time machine you have to go into System Preferences > Time Machine. Click on Time Machine to get started. As you can see there is a previous Time Machine Disk listed. I was testing Time Machine Backups to a different older NAS before I committed to this project. Click on Select Disk to select the network share. 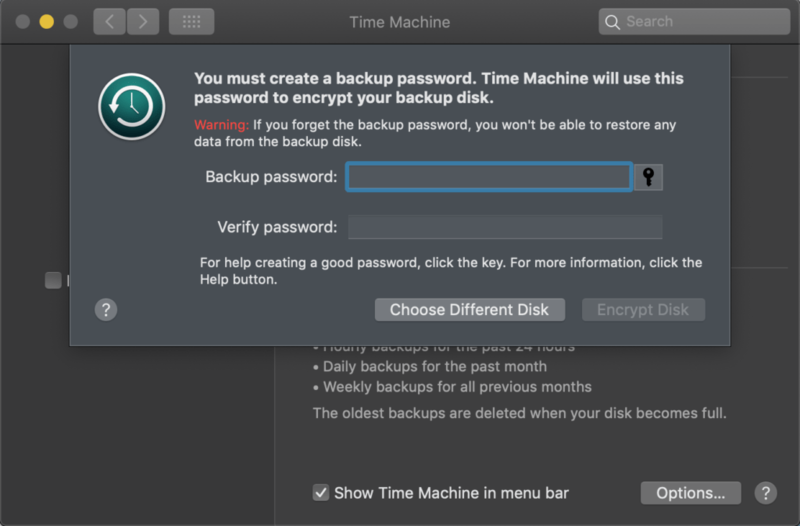 I selected the Time Machine share on the NAS and selected “Encrypt Backups”. Because Time Machine is encrypting the backups I don’t need to encrypt the shared folder. This transfers the encryption load from the NAS to the Mac. Click on Use Disk to continue. Because I have a the lingering setting from testing Time Machine network backups. My Mac is asking me what I want to do with that back up. I don’t need to save that back up set. 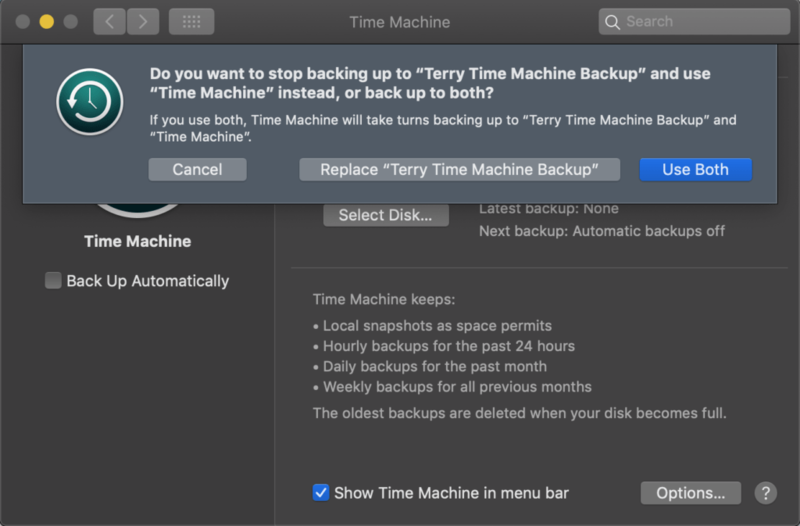 So I’m selecting Replace “Terry Time Machine Backup” If you have multiple backup set you can choose Use Both. Next Time Machine will connect to the Share click Connect to continue the set up. 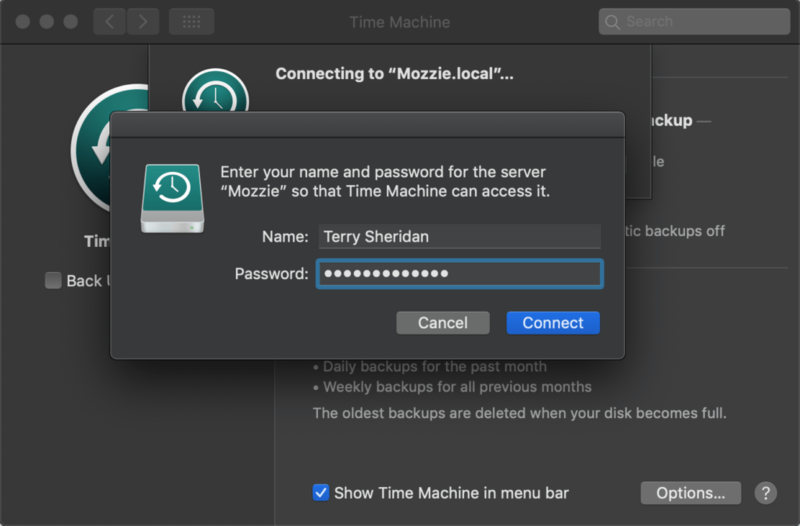 Provide your User credentials for the NAS for Time Machine. This is a second copy of the connection properties outside of the saved Finder credentials. Since I specified to encrypt my backup I need to provide a password for the encryption. Create a password that is complex and long but, don’t loose it or else your backups will be junk when you need them. Set a password and Click Encrypt Disk to continue. As you can see the backup has been configured and will start the first full backup in a couple of minutes. Click on Options to the see the advanced settings. On the Options Page the only thing I would suggest is to check the box for “Back up while on battery power”. If there is any locations or external drives that don’t need to be backed up, you can add them to the list to be excluded from the backup. Click Save to save your changes and watch the backup start. When you’re doing a system backup like this I would recommend plugging in your macbook or macbook pro. The first full backup is going to take a lot time and will run down your battery. After the first backup is complete then all the backups after are just incremental backups that are generally small. 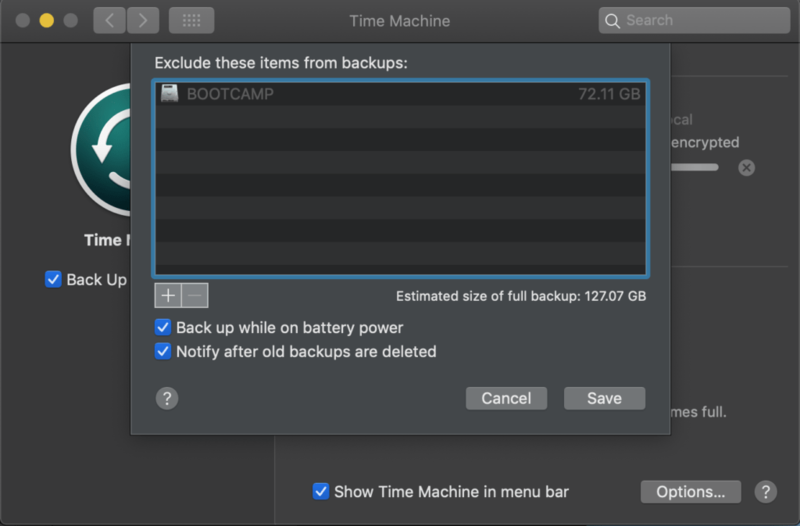 Just keep in mind if you’re reorganizing your entire photo, music, document, or movie library that could cause a larger incremental backup that could take longer to complete. Also, depending on your wireless configuration at home you may want to use a wired connection to run the first backup. On current Macbook/Macbook Pros, you may want a to buy a thunderbolt to ethernet adapter or USB to ethernet adapter. In my case, I have Unifi AC Pro access points so my wireless connection is 1300mbps to the access point and they are connected with gigabit wiring to the switch. So wired versus wireless for me is a wash for me. But if you have an older wireless router or access points a wired connection could be a 2:1 ratio for a performance gain. If there is any questions feel free to reach out in the comment section of twitter. Hi Terry, While searching for answers to issues I had with my lab setup I came upon your setup and it seems we have a very similar lab environment (I also own a DS918+ with maxed out memory, NVMe cache, drives, etc.) and my idea was to use it as my home/lab system, as well as my Plex Server, data storage (with cloud backup) and iSCSI target. I’m also an IT guy. 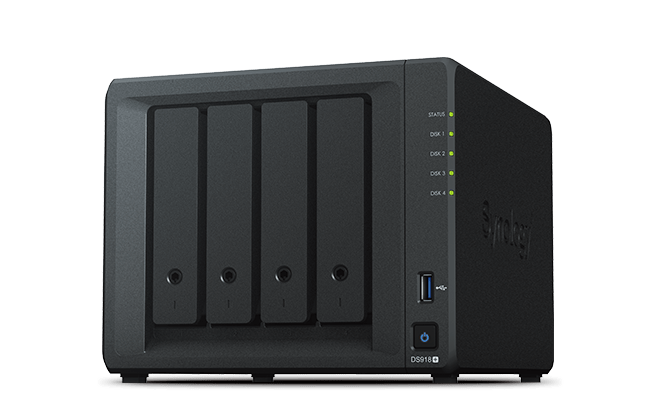 I have 25+ years of experience on the infrastructure side, but somewhat new to working with Synology but found it mostly easy to work with (my experience is mostly all things Microsoft, Unix, network, Infrastructure and Cloud)….some Dev experience too: Java, .NET, C++. I chose the DS918+ as my server for similar reasons you had, but I was coming from a Windows Server world (Windows Home Server, then Storage Server, then Windows Server Essentials). I’d love to chat with you about your experience with your setup and share mine. -CrashPlan for Business -awful slow, switched to cloud backup. Anyway, I’d love to chat with you. That’s where I always battle and also I just end up staring empty display for long time. I just try to stay on point. My problem is that i can go on for days about a topic so keeping it short is difficult for me as well.